Showing off your holiday pics is so dated; the way forward to let people know where you've been on your travels is with the Scratch Map. 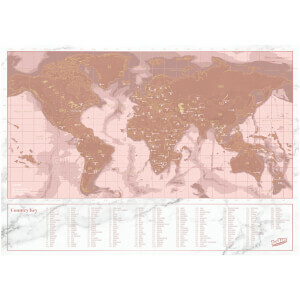 A personalised map of the world, the idea is to scratch off the places you've visited to reveal colourful, geographical detail underneath, making it stand out. Not only is it a decorative, visual piece to hang in your house, it's also a more discreet way of bragging about your hols. The top layer of the scratch off map is made of gold foil, all you need to do is rub it with the edge of a coin, scratch-card style. It makes a great talking point, and provides the perfect opportunity to share your voyages around the world. 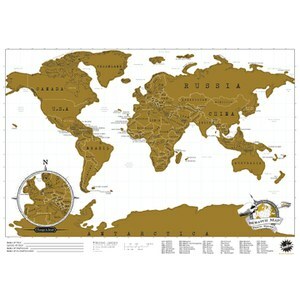 The Scratch Map might inspire you to globetrot to remote Timbuktu or far flung Asia just so you can uncover that vital area but more importantly, to impress people with your worldly travels. - R.K.
We are unable to deliver this product outside of European delivery addresses.